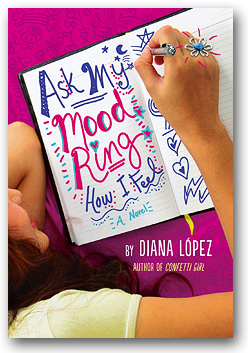 It's the summer before eighth grade, and Erica "Chia" Montenegro is feeling so many things that she needs a mood ring to keep track of her emotions. She's HAPPY when she hangs out with her best friends, the Robins. She's JEALOUS that her genius little sister skipped a grade. She's PASSIONATE about the crushes on her Boyfriend Wish List. And when her mom learns she has breast cancer, Erica feels WORRIED and doesn't know what she can do to help. Then one day, Erica's family visits a famous church. There she discovers el cuarto de los milagros—a "miracle room," where she decides to make a promesa to God in exchange for her mom's health. As her mom gets sicker, Erica quickly learns that juggling family, friends, and school while fulfilling a promesa is STRESSFUL, but with a little bit of HOPE and a lot of LOVE, she just might be able to figure it out. "López skillfully balances emotional moments with humorous ones, offering an honest portrait of a family under strain. Chia's clever, cheeky voice and a strong cast contribute to an inspiring story about developing 'a special kind of bravery.'" "The many characters in Chia's life are individually and lovingly drawn...Readers will feel like Chia's family and friends could do anything as long as they stick together--and they may be right." "Chia's voice shines...A fast-moving, absorbing read about how one person's illness can affect the whole family in many different ways." "With one out of eight women facing breast cancer, we're long overdue for a realistic yet hopeful story about the disease's impact on young people. Diana López fills the void with a touch that is both honest and light. Ask My Mood Ring How I Feel shows that cancer can change everything and nothing all at once. Whether she's working hard at fulfilling her promesa or bickering with her little sister, Chia is a hero we identify with and root for." "An honest, sometimes uncomfortable, but always hopeful look at how cancer affects family...Erika's story is full of the healing power of love." "I kept hoping that pink was indeed a color on Chia's mood ring. Pink, like the Blues, is the story of struggle, of surviving, and what is oftentimes a difficult healing, but a healing nevertheless. My own promesa after reading López's wonderful novel: to run alongside my wife and hundreds of thousands of others on that day of the Race for the Cure from here henceforth."